Quality Parts at a fair price - 1000's of Satisfied Customers. Plane Parts Company was founded by the owner of a 1971 Piper Cherokee PA28-180 aircraft who is both an engineer and a pilot. Of course, like most Piper Cherokees, the interior of his PA28-180 was fairly well worn out and it needed a complete refurbishing. What quickly became evident was the complete lack of replacement interior plastic parts. What few parts he did find were outrageously expensive and would take weeks to get. We are sure that you too have run into the same experience. One of the things we found hard to believe was the high price that Piper Aircraft was charging for the smallest items. 20 years ago, a fresh air vent cup from Piper was $45 and the retaining flange was $38! Today, we offer the same parts for around $10 each. Plane Parts Company set out to make the finest and most reasonably priced replacement interior plastic parts as possible. Our company owner wanted the very best fit and finish and was certain that our customer's would want the same. Each and every interior plastic part that we make is painstaking re-created by hand from the original parts. Unlike our competitors, we didn't attempt to cast a mold from the original part. Why? Because any original part is usually in bad shape, with distortions from the installation and exposure to heat. In addition, plastic shrinks over time - so most original parts are actually smaller than they started out being. Molds that are cast also shrink and then new plastic shrinks some more and before you know it the re-produced part simply doesn't come close to fitting properly. In addition, many original parts were poorly made in the first place. We managed to acquire some brand new (old stock) original Piper parts and we were amazed at the poor fit and quality of many of them. Just because you have a Piper OEM part or a part that is claimed to have been made from an original mold doesn't mean that you will have a part that is a good fit and finish. At Plane Parts, we have taken the art (as well as the engineering) of producing replacement interior parts to an entirely new level. We realize the value and pride of ownership that many aircraft owners have and we want to produce an award winning replacement part, one that will do justice to the substantial investment that any aircraft owner has made in their aircraft. To ensure the best possible results we invested in and sought out aircraft and airframes that we could use for fit testing. We carefully analyzed the original parts and the locations in the airframe that they went in and designed a replacement part and built a mold from scratch to create the exact size and shape part to fit in the right place, the right way while still retaining the look, feel and style of the original parts. We pay close attention to the smallest details because after all, these parts are basically the aesthetic finish of the cabin and they have to not only fit and function well, but they have to look great! We didn't take any shortcuts like our competitors have and the result is that the replacement interior plastic parts that we produce fit, function and look better in many cases than the original Piper interior plastic parts. Plane Parts isn't just about well engineered interior plastic parts. The very core of our company philosophy is about providing excellent customer service. We go to great lengths to ensure your satisfaction. Unlike our competitors, we maintain an inventory of parts and 99% of every order that we receive can be shipped within 24 hours. Our parts are as fully trimmed and ready to install as possible. We have heard numerous stories from customers that came to realize why our competitors charge less. It turns out that most of the parts that they ship are far from ready to be installed - in some cases they require hours of painstaking work to trim openings in the part or to adjust the shape and size in order to obtain a proper fit. Don't be fooled by a low price. What you save purchasing a cheaper part could easily be burned up two or three times over paying your mechanic to install a part that needs extensive trimming and adjustments. Unlike so many aircraft part suppliers, Plane Parts offers a 100% money back guarantee on everything that we sell. If you are not absolutely satisfied with what you receive you can return it to us for a full refund. Our parts have been engineered and FAA Approved from the ground up to provide an excellent fit and finish. We hold a Parts Manufacturer Approval (PMA) which means that we are authorized to actually make new parts - not simply 'repair' old ones. We are not a repair station and we don't make half finished parts like some of our competitors do leaving you to figure out how to trim and install. We have paid close attention to the details, from the color and texture to the finish trim. Our parts are precision made using the latest CNC technology in order to ensure an excellent fit. All parts are designed to maintain original look and texture. Overhead & window trim parts are off white (almond). Instrument panel covers and floor parts are black. Parts manufactured from certified material that exceeds FAR Part 23 and meets commercial (FAR Part 25) requirements for flame resistance. None of the parts listed in this web site require any form of airframe modification for installation. However, due to the dimensional variances between airframes, even the same model airframe, some parts may require modification prior to installation. 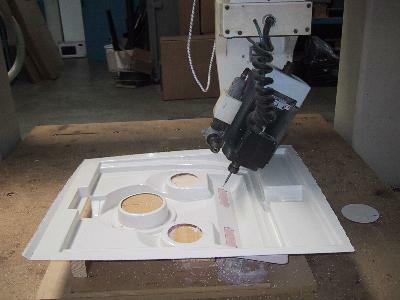 In all cases such modification is accomplished by trimming excess plastic from the part in order to achieve an acceptable fit and finish. In some cases where the installation process is involved, installation instructions are provided.